Attracts dust and dirt, protecting your paint job. 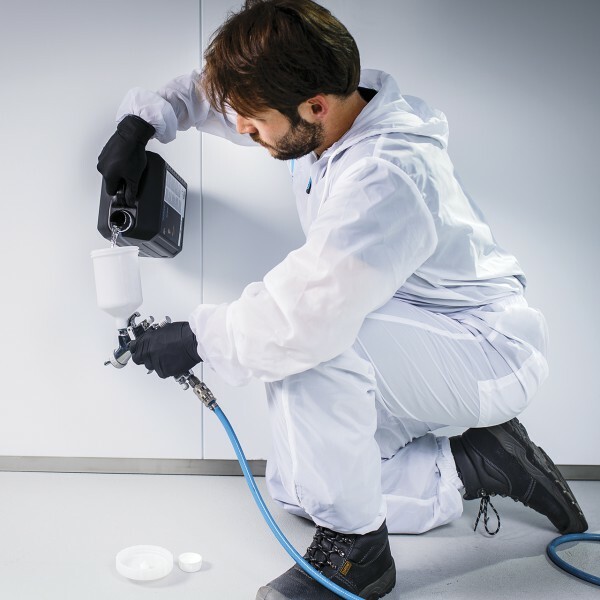 Swirling dust and dirt are the main source of contamination during paint jobs. Much of this contamination can be prevented using Tander Dust Control. This clear, tacky solution keeps dust and dirt down on the floor, preventing it from swirling around and therefore protecting your paint job and prepared paints from contamination. Quality work calls for Tander Dust Control! Tander Dust Control offers up to four weeks' complete protection! Depending on how often you use your spray booth, Tander Dust Control can be used for longer than the recommended four weeks. Apply an equal layer on the surface with a pressure sprayer. Layers can be applied on top of each other, and layers can be washed away with water. ; Suitable for use in spray booths and preparation areas. Protect from direct sunlight, store between 15 - 20°C. You can apply multiple layers on top of each other before cleaning the surface. Can I apply multiple layers of Dust Control on top of each other? Yes, Dust Control can be applied in mutiple layers. We do however advise to periodically clean before reapplying. Can I use this for the entire spray booth? Tander Dust Control is intended to be used on the spray booth floor. For the walls of the spray booth we advice to use Tander Tacky Booth Coating. How often do I need to reapply Dust Control? Tander Dust Control should be reapplied around every 4 weeks with average use of the spray booth.